On the Run II marks the first world tour together in four years for music’s power couple, Beyoncé and Jay-Z. In that time, the music has become more complex and so has the stage show. The two stars are backed by a sizable combination of their individual bands, including an entire horn section, as well as backup vocalists and dancers, all of whom wear in-ear monitors, as well as wireless microphones for every vocalist. All of these elements are connected via an Optocore HMA fiber loop between two DiGiCo SD7 consoles for the FOH mix (one primary console and a second for use by supporting acts on the tour) feeding a d&b audiotechnik J-Series PA system, while four more SD7 desks are assigned to the monitor mixes. In addition, another SD7 is on the tour to mix full-band rehearsals as set lists change and new songs or new arrangements are added (the duo’s hit album, Everything Is Love, dropped in the middle of the tour), and to mix and record writing sessions as inspiration strikes during the 48-city, four-month-long tour. A DiGiCo SD12 console is also on hand to mix vocal rehearsals in dressing rooms. 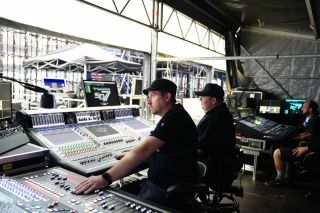 The five primary consoles on the tour use five DiGiCo SD-Racks, with a sixth used as a support rack. And he’s not kidding. With practically both Beyoncé’s and JAY-Z’s full musical entourages in tow for On The Run II, the road logistics alone are absolutely staggering. It is a setup that can only visit the biggest of stadiums because “it definitely won’t fit anywhere else. But the SD7s can handle it all. When the SD7’s Quantum 7 processing update becomes officially available, we’ll technically be able to handle even bigger productions, but I’m not sure that we should tell them,” Berry said. Berry goes on to compliment DiGiCo’s “Ultimate Stadius” 32-bit Mic Pre-Amp cards, which are being used for the first time on all of the insert inputs, as well as a number of the company’s brand new 32-bit DAC modules. “One of our stage racks is completely full of outboard analog processors, so we’re taking everything D-to-A and back. The 32-bit cards give a really pleasing, warm, wide sound, and it was immediately noticeable, especially on keys and drums,” said Berry.